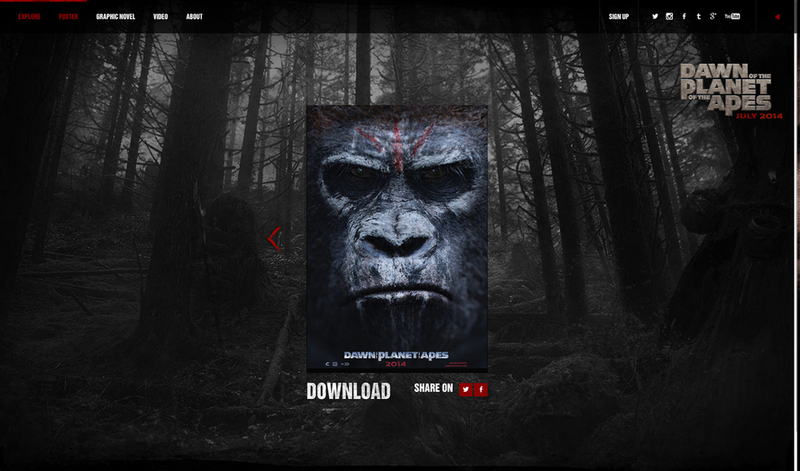 Following up from the hugely successful (and amazingly awesome) Rise of the Planet of the Apes franchise reboot, Dawn of the Planet of the Apes is one of the most anticipated summer films of 2014. The below campaign highlights are the reflection of our drive to reinvigorate the fan base and create intrigue from the general audience. A year out from the films 2014 release we launched our campaign at the 2013 San Diego Comic Con. Not sure if you remember, but Rise of the Planet of the Apes ended (Spoiler Alert) with a Pilot dripping blood and about to board a plane. 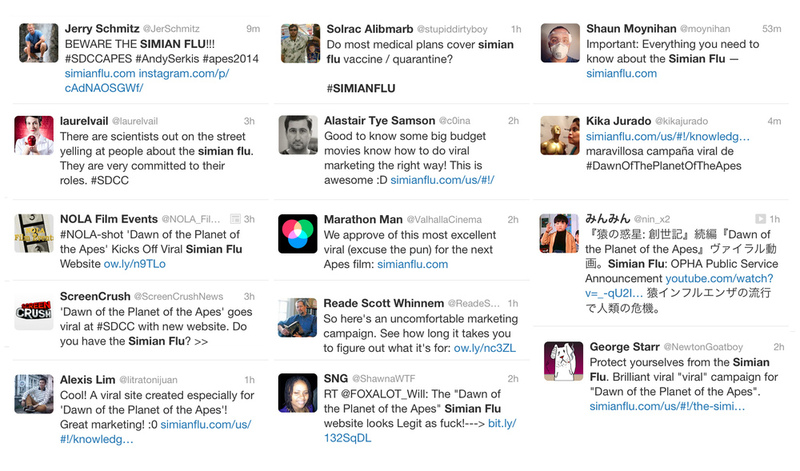 Thus spreading the Simain Flu worldwide, leaving audiences asking "is the human race screwed?". 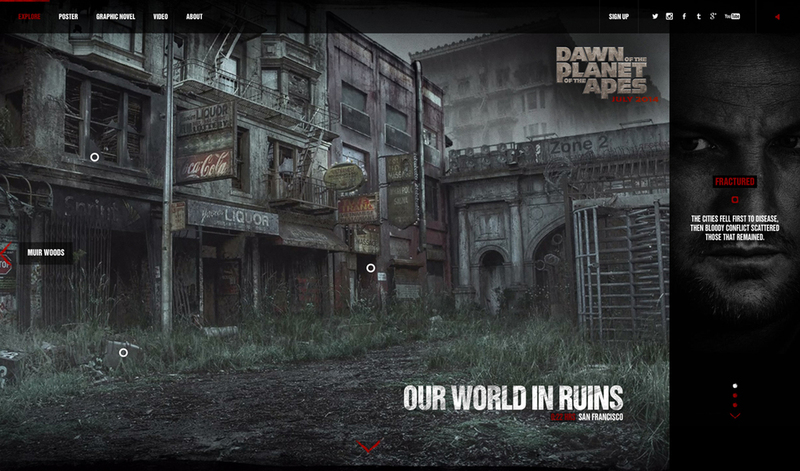 To help kick up the answer to that question and support the Dawn of the Planet of the Apes tease footage shown at the 2013 San Diego Comic Con, we developed a PSA video along with a supporting site SimianFlu.com. The disease has spread worldwide, protect yourself, protect humanity. It's only natural that any outbreak would have a PSA speaking about the realities of the disease. We had ideas that we're too harsh, some that were too medical, this one that I storyboarded landed somewhere in the middle. I didn't want us to look fake, campy or like we were trying too hard. The copy needed to warn with a slight rub on the back. The PSA needed to be a standalone component as well as an integral part of the site both as supplemental content and more importantly a major part of the story telling. With limited resources, we hit one round and animated this piece the next day. Not wanting to just settle on what visitors would expect out of a film studio, I took the angle of large brochureware, high end and visually informative. 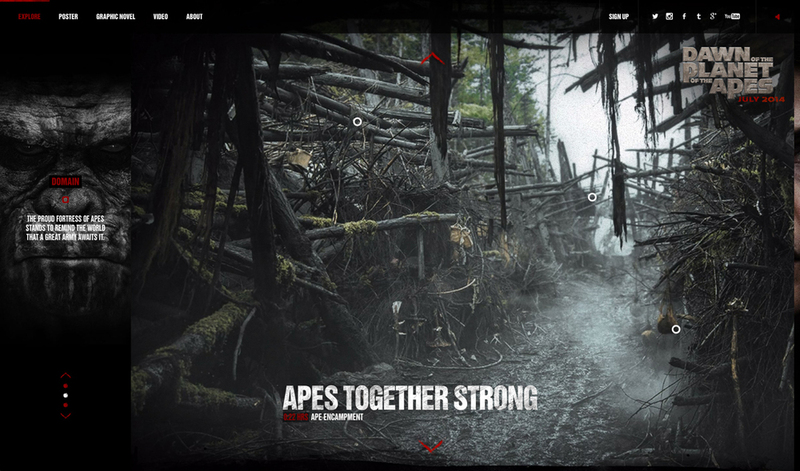 The results felt real and made the education part of the connection between the last film and Dawn of the Planet of the Apes digestible and "fun". 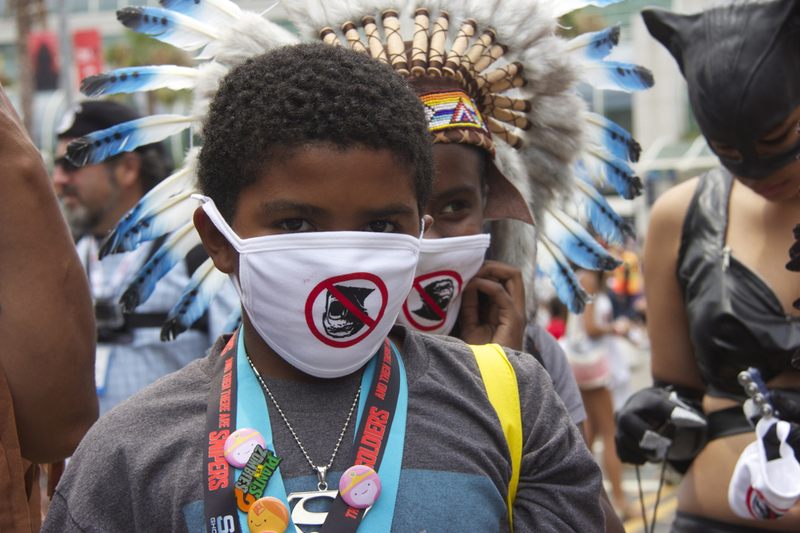 A street team of "Medical Professionals" were deployed to educate the public as well as provide necessary preventative face masks and sanitizers. 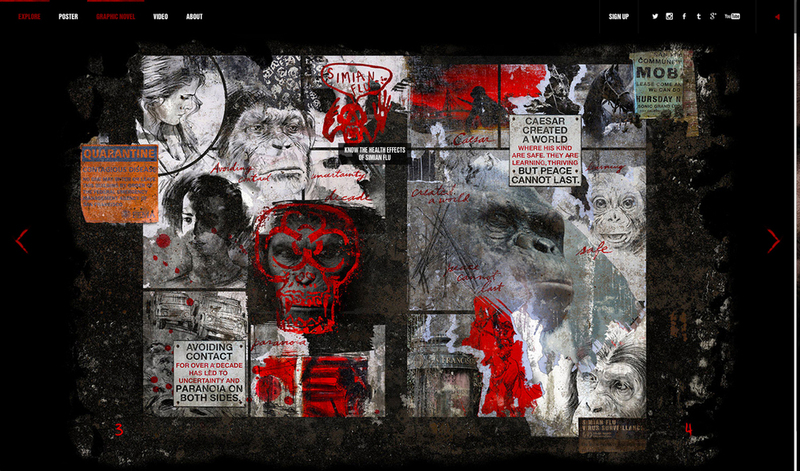 All with the Simian Flu site information to help with the cyclical experience. Twitter blew up through the Comic Con campaign period, mixed with people playing along with the Simian Flu warnings to compliments on the campaign materials. 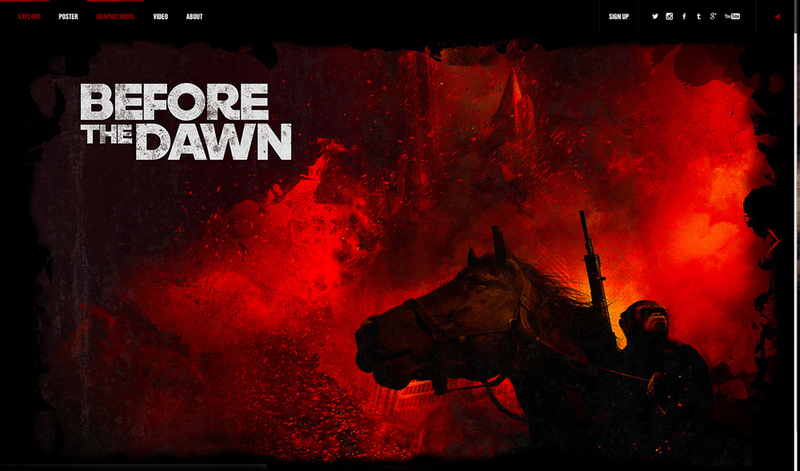 Following up from the Comic Con events we coincided the launch of the official Dawn of the Planet of the Apes with the Teaser Trailer release. We brainstormed many concepts but landed on a solution that effectively brought the Simian Flu devastation to a real world visually immersive reality. Two worlds have been separated through the effects of the flu and we gave the first glimpse into the communities of Apes and Humans, setting the stage and tension before the collision of the two. Human Domain entry rollover reveal. 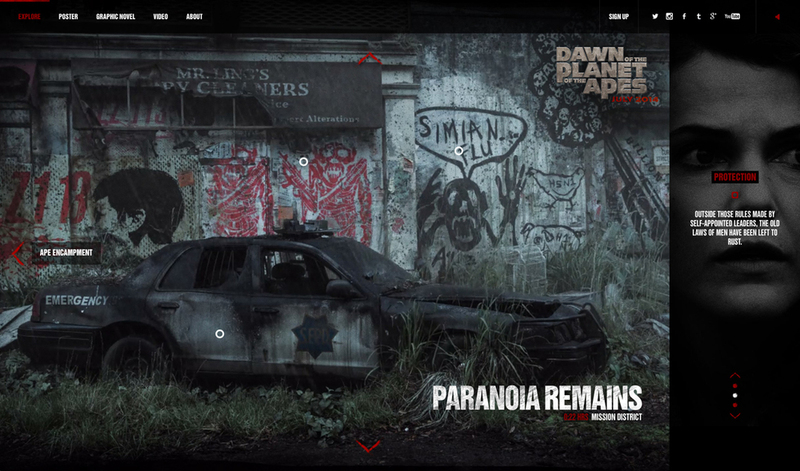 Apes Domain entry rollover reveal. With 10 years between the first films storyline and the present, quite a bit of bridge storytelling needs to be done. Through the below videos we artistically communicated the changes that have happened to prominent locations across the globe.